A Mormon Candidate with Binders of Women? Now I know why Ann flashed that “look” at Mitt when the debate ended last night. 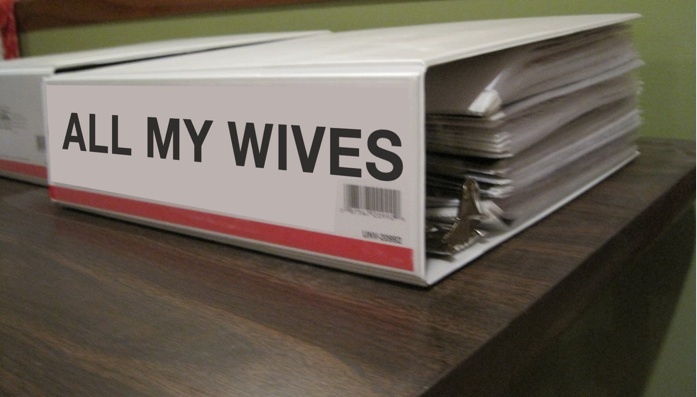 Most men have their “little black books” but Mitt has his “binders full of women”. This is the real reason Anne Romney “showed embitterment” as Hill says, “I knew right away who lost this debate,…Ann Romney right after the debate showed embitterment.” Mitt’s secret was out. These are not the binders that came from a coalition asking Romney (not as Romney lied when he said he asked them) to consider filling Massachusetts cabinet posts with qualified female candidates. Now the whole world knows about Mitt’s secret binders of women. I must have control of your body. Your reproductive rights are my right. Believe me when I say to trust me. My approved method of birth control “trust me, I’ll pull out in time”, otherwise, please review rule #2. Equal Pay is not important to women. The Lilly Ledbetter Act is not fair to business owners. As a business man, believe me when I say we need to exploit women whenever we can. I will make sure you get home in time to fix dinner. You don’t need equal pay or health care for your needs. Women are special. I didn’t promote women to partner at Bain or appoint them to senior advisor agency appointments where they could make a difference, because it’s important that you get home in time to fix dinner. You don’t need Planned Parenthood. Remember Rule #2. Just go to the emergency room for that other “female” stuff. Ladies – don’t get old. This is how you will stay out of poverty. If women didn’t age, they could avoid being in extreme poverty, like the 17 million women in America who didn’t listen to me. I have a detailed plan that will slash taxes by 20 percent for everyone; bring down gas prices; balance the budget; create 12 million jobs; fight a war with Iran; expand the military, and get rid of the deficit – all in my first year as President. My 5 point Plan is called “Trust Me” The title explains all the details. You people don’t deserve any more information. This entry was posted in Presidential Race, War On Women and tagged Anne Romney embitterment, Binder of wives, Binders Full of Women, Equal Pay Lilly Ledbetter Act, Mitt Romney, Mitt Romney's Binders full of women, Mormon Binders full of women, Planned Parenthood, Presidential debate, War on Women. Bookmark the permalink. 2 Responses to A Mormon Candidate with Binders of Women? Hey, 1 plan is better than none. I think we should give him a cookie. Hey, he’s going to have access to your baby making machine, I’d call that a cookie! Guess Who’s Upset with Our Growing Debt?